The 29th – 30th October 2013 see the return of the London Performance Marketing Insights conference and expo at the Westminster Park Plaza. Along with hundreds of attendees, it’s a chance to meet some of the peers of the industry, attend thought provoking sessions and grab a few beers at the networking events. Under pressure to grow your affiliates or get them ‘doing more’? Have no budget to spend? Fear not! During this session you’ll learn ten of the top FREE tools of the trade when it comes to affiliate management. You’ll see real life examples of the hands on tools that affiliate managers use and how you can harness these tools when back at your desk. Expect to hear quick and easy solutions that can help source potential diamonds in the rough and get those affiliate sales growing. Use the code SPKLON13%10 to save 10% on your pass! According to a recent study undertaken by affiliate marketing network Rakuten LinkShare and advisory and research firm Forrester, affiliate marketing is poised to fuel cross-border commerce. Customers in the US who commence their purchase journey on an affiliate site are likely to spend more that the regular online shopper. Shoppers show the most loyalty to brands that display offers on multiple websites. Affiliate shoppers are the most sensitive demographic to expensive shipping costs. With regards to the UK, the study showed that online shoppers expect merchants to compete for their business, with nearly a third stating they would return to an abandoned shopping basket if they received a subsequent discounted offer. It also brought to light the high proportion of shoppers who make online purchases form somewhere outside their own country. The UK has the highest percentage, with 75% purchasing cross-border within the last year. The study helped to highlight the diversity in the preferred shopping practices displayed by different nationalities – apparently Canadian consumers lead the pack in their preference for loyalty programmes, with 37% claiming to make regular use of cashback and loyalty sites compared with an average of 22% in other countries. Other intricacies shown by individual nationalities include the Japanese being the most frequent users of multi-brand and price comparison shopping sites. He continued to say the report displayed that e-commerce infrastructure must adapt to this new global market, and the idiosyncrasies therein. Shipping expenses, time, lack of local payment options, taxes, and other logistical issues are holding back the potential growth the global e-commerce model has. Halivand said, “With e-commerce expected to grow to $1.3 trillion by the end of this year, brands and advertisers are looking for advice and insights for how to plan and execute their global online strategies. We believe the study provides the industry with fresh data and key insights that highlight how performance marketing has become a leading strategy for online retailers entering new markets.”. As part of our commitment to the local community, Bright Digital Minds have teamed up with a number of industry experts to offer local businesses FREE online marketing advice, all in an informal and relaxed environment. We are inviting anyone who owns a business or website, from Farmers, Driving Instructors, Schools, Musicians, Shops, Cafe’s and even local landlords and Guest House owners to the Wheatsheaf on October the 2nd 2013 between 5pm and 7pm to listen to some top tips for getting the most from your online presence, along with the opportunity to talk more afterwards. All are welcome to come along, although places are limited. Please join our event here - https://www.facebook.com/events/211275172370862/ or give us a call and we’ll pop your name down. Founder of Bright Digital Minds, Hannah Swift said, “As a young business owner, I think it’s important to give back to the local community, and help other small businesses reach their potential through various online channels. The new training initiative aims to show anyone in the local area that they can get more out of their current online activities, from collecting email addresses to harnessing the power of ecommerce. I don’t want to run evenings that are ‘death by powerpoint’ or that are overwhelming, instead, we’ll be giving tips and case studies from our years of hands on experience, that are accessible to all.”. Founded in 2011 by Hannah Swift, Bright Digital Minds is focused on delivering high impact performance marketing campaigns on budget and on time. Based in Bakewell, Derbyshire, we are committed to supporting the growth of fellow local businesses with our apprenticeship schemes and with the launch of our free training initiative. If you are think of setting yourself up in affiliate marketing, it can be made at lot less stressful than it first seems to be. Once you have broken the ice and made your first sale, the hard work is mostly over. Reaching the stage of your first sale can involve a lot of hard work and graft. There are many steps to reach that all important first sale, which includes selecting a niche in which to operate in, this can be a huge task in itself, there are also various other steps including SEO, email marketing, promotion, traffic generation and more. For a thorough checklist of all the legwork you will need to put in before being rewarded with that all-important first sale, take a look at the below infographic created by Mervik Haums. 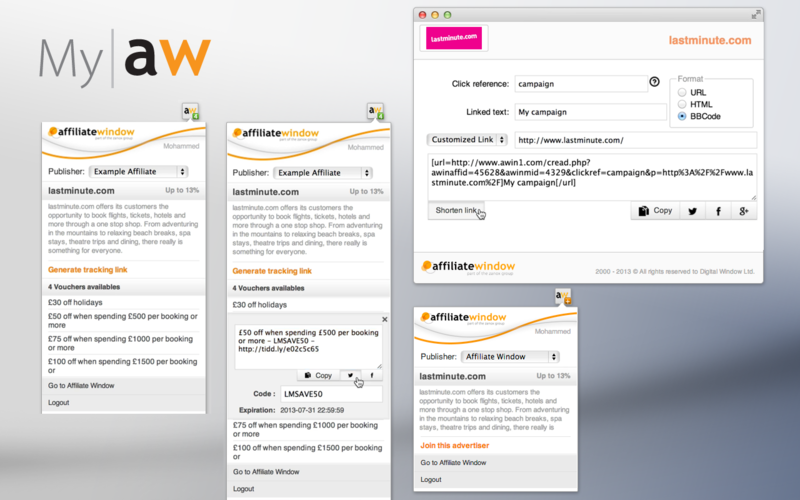 Affiliate Window has released their MyAW, a new Google Chrome extension for publishers. MyAW is downloadable from the Chrome store and available now. MyAW adds a button to the Chrome toolbar which can be used when a publisher visits any Affiliate Window advertiser site, whether they are joined to the programme or not. The extension also shows all the latest consumer offers from their system and will highlight the exclusive vouchers available to publishers. For those publishers with multiple accounts, ‘one-click’ account switch functionality has been added for ease of use. The plugin also offers a ‘one click’ deeplink generator. Affiliate marketing may be a complicated and confusing field, especially if you don’t know where to start. Affiliate tracking software company, Dekh, has simplified the whole process for any brands that are looking to expand their marketing strategy. It has created an infographic containing 51 steps that will help any advertiser looking to succeed in this seemingly complicated area of marketing. This useful infographic proves that can be adopted with relative ease if you accomplish a series of key tasks in the correct order. Paid On Results are the first affiliate network to bring out a new tool which allows merchants to nofollow links to their site and affiliates to nofollow links from their site. Nofollow is a piece of code which tells a search engine not to follow a link. This means that the link will not pass any page rank or authority which are metrics used in calculating the ranking of a site. This new tool has been introduced as a growing number of merchants are convinced by some SEO companies that the reason for their drop in rankings is in part down to affiliate links. With the nofollow tool merchants can decide whether to follow or nofollow all affiliate links going to their site, which for Paid On Results is a lot easier than trying to counter the SEO companies arguments. This simple solution means that merchants on Paid On Results can ignore the advice of SEO companies and focus their attention on building their affiliate programme. Unearthing how to keep on top of your affiliate programme can be difficult, however we believe that with covering the basic elements, you can drive your programme forward this new year. We have put together some top tips for ensuring that your affiliate programme is as effective and efficient as it can potentially be. They are simple. They may seem trivial. They are also the most obvious of things. They are also the most over-looked when speaking with other account managers, so don’t snarl at us before you ensure that you have covered these areas too. There will be certain affiliates who you always turn to who drive the majority or large amounts of sales for your programme. One thing that we like to do is create a list of the top-tier affiliates so we can keep track on what is selling where. Ensure they’re signed up to your programme firstly and foremost, and then double check their site. You want to make sure that they have live links in listing that are relevant to your programme on their sites, and if not, mention this to them. You want to take special care of these golden few, as all it takes is for them to start making better sales elsewhere, and you have lost an important affiliate. Be sure you supply them with interesting consumer messages frequently so they can keep on top with fresh data, links, offers etc holding you in place. For any affiliate, it is more than important to create and establish a good working relationship with your contacts. Staying in touch is vital, and we don’t just mean by consumer messaging and bulk emails. Pick up the phone every now and again or at least send them a personal email just dropping in and ensuring that everything is OK. It’s in our human nature to care more about something if someone shows you a little time and affection. We’re not saying you have to wine and dine your contacts, but a little wave and a nod here and there doesn’t go unnoticed. Make sure you have done everything you can do to keep them happy, and as a result, you will see results and be happy too! Don’t forget about the ‘little man’ in your contacts lists. We all have those contacts that crop up towards the bottom of our reports pages that haven’t generated that much or any volume in sales. Don’t assume they have everything they need and definitely don’t write them off just yet. Check in with these contacts periodically to ensure they are up-to-date with things and don’t need a little help. You will be surprised to hear that sometimes, people just need things explaining to them and once this has been done, you may uncover a hidden treasure cove in this contact. To sum up, one of the best tips that we can offer for running an effective and successful affiliate programme, is ensure that you have the basics covered. Things like speaking with your contacts, ensuring people know what is expected of them as an affiliate and updating them with consumer messages to push out to generate sale are the fundamentals of affiliate marketing and require your attention. With this in mind try we are quite sure that you will see a difference in your programme and the results you see.